Do you own a body shop and need to get customers coming into your shop? 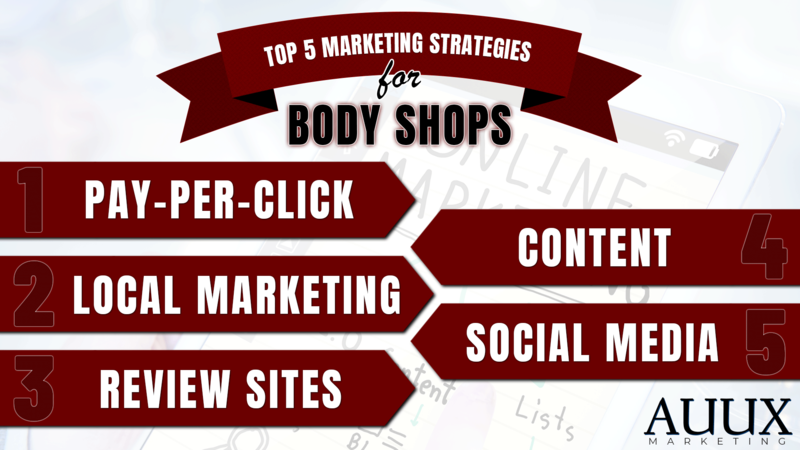 These five proven body shop marketing ideas will help your website and collision repair center get noticed. I will assume you already have a functional website with proper SEO functionality and a solid UX design. PPC – Pay-Per-Click advertising is the fastest and most effective way to get in front of customers looking for businesses on demand. If a customer has a car accident and needs to find a Collision Center they will most likely search on Google for the keywords “Collision Center near me” or other variations. If you search on Google, you can see four ads in the top spots and then the local 3 pack map listings. You can purchase ads right now and be in the top four positions with the right campaign and keyword set-up. PPC is a little pricey but one of the best ways to get people to see your business. Local Maps Marketing – The local 3-pack map listings on Google are a great way to get people to find your business. If you want to see how that works visit Google and search for “Collision Repair near me” you can see after the top ads, 3 local map listings. These listings are great for Collision Centers and their customers. They help your customers find the right Collision Repair near their location and will also provide a clickable map and phone number to be able to reach you asap. If you are not listed in the top 3-pack you are missing out on a good amount of new business. Review Sites – Consumers read reviews and they rely on sites like Yelp, Google Reviews and Angies List to find reputable companies. You have to make sure your company is properly represented on review sites. Customers will read reviews before making decisions on who to contact. Claim your business on the review sites and make sure you respond to customer in a timely manner. Content Marketing – Content Marketing can be a video, a press release, information about your company and services, infographics, and so forth. Content marketing will help get the information out to your customers and will help in your SEO efforts. You can market your content on Social Media, Website, blogs and other resources. Social Media Marketing – Customers want to hear about your business and see activity on your social media accounts including Facebook, Twitter, Instagram, Linkedin and other avenues. Social Media is a great way to keep your loyal customers and fans up to date about your company. AUUX Marketing can help you with your Collision Repair Center Website Design and marketing. Our custom body shop marketing solutions will help you get new business consistently and get you noticed before any of your competitors get a chance. Check out our Collision Repair Center Marketing and Design solutions. Our experienced marketing professionals will help you get started today.